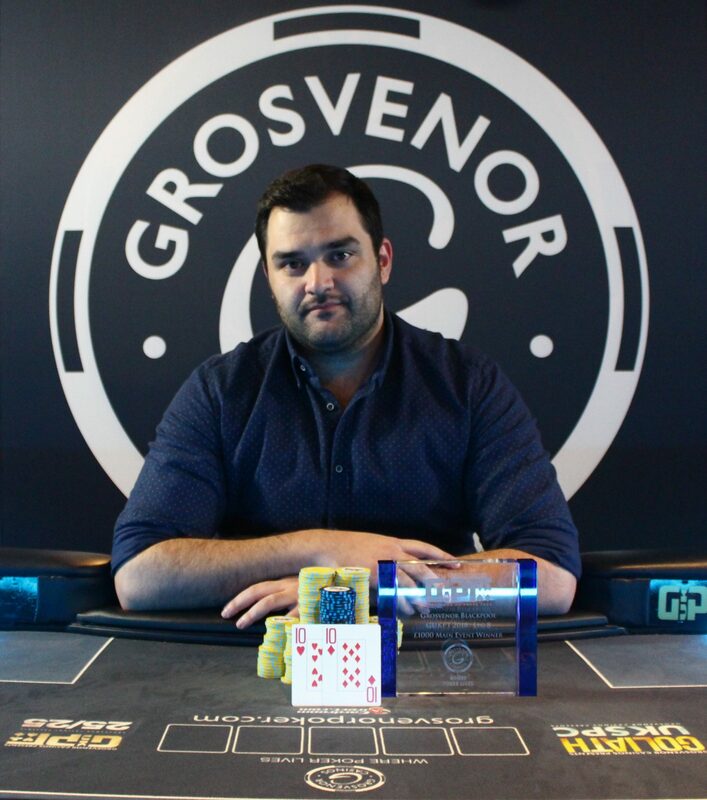 Third time’s a charm for UK Poker Pro Yiannis Liperis, as he finally gets his hands on the GUKPT Blackpool trophy after some close calls over the years. 29-year-old Yiannis is a familiar face on the GUKPT and 25/25 circuits and has accumulated quite the poker resume including not one but two second place finishes at this very event. This year Yiannis broke his runner-up curse overcoming his final opponent, Ning Lu, for the 2018 GUKPT Blackpool trophy and £84,250 in cash. Grosvenor Casinos was delighted to witness big numbers across all events, with cash games also running around the clock. This year the GUKPT Blackpool Main Event attracted 304 entries generating a £304,000 prizepool. In total there were 30 prizes with the top 10 finishers taking home over £200,000 in cash. Amongst those 30 were many satellite winners including finalists Fred Maher and Liam Hooks and many established Pros with likes of James Mitchell, Mitch Johnson, Andy Hills and Jeff Kimber, all making the money. During Wednesday’s £150+15 Buy-in No Limit Hold’em side event all eyes were on one man, sporting giant and former world heavyweight boxing champion, David Haye. The Hayemaker and Grosvenor Casinos have joined forces in order to fulfil David’s ambition of learning the game of poker, all in preparation for next year’s Goliath. Sadly for David his first GUKPT event didn’t get off the best of starts as he busted after just three hands! Luckily for him he has three formidable poker professionals in his corner; Jeff Kimber, Katie Swift and Joe Beavers, who were all present for a post-game analysis. “He’s got loads to learn but he’s a champion sportsman and that competitive edge means he wants to learn more and get better” said Jeff Kimber. The 12th season of the GUKPT will be coming to a close with the final showcase, the GUKPT Grand Final, kicking off this Sunday at The Poker Room on London’s bustling Edgware Road. The Poker Room, located above Grosvenor Casino Victoria, always hosts a spectacular finish to a great year of poker and this year it’s expected to be bigger than ever. The GUKPT Grand Final is guaranteed at £400,000 with a buy-in of £2,000+140 and despite there being just a week until the Main Event kicks off there are still plenty of opportunities to win a seat on Grosvenorpoker.com or live at The Poker Room.